(186 x 226 mm) 8.3 x 11.7 in. A4 (Mounted) 7.3 x 8.9 in. (186 x 226 mm) 11 x 14 in. (272 x 330 mm) 11.7 x 16.5 in. Guhyeshvari, meaning the "Secret Goddess", appears here in her nine-headed and twelve-armed tantric aspect upon her complex throne. She is powerful, semi-wrathful and dark-blue in colour, and stands in dancing bow-and-arrow posture with her left foot resting on the back of a brown jackal above the fierce form of Bhairava, who lies prone upon the plinth of her ‘five-corpse’ throne. Bhairava is blue-black in colour and extremely wrathful, with three bulging round eyes, bared teeth, and four arms. Bhairava wears gold and bone ornaments, a five-skull crown, a tiger-skin loincloth, a serpent necklace, and a garland of skulls. With his first pair of right and left hands he holds a curved knife and a skull-cup, and with his second pair a damaru and a trident. Serving as pillars to support the plinth of Guhyeshvari's throne are the five great Hindu gods: Kumara, Vishnu, Brahma, Indra, and Shiva, who squat upon the wide lotus base and cushion of her throne, with two of their four hands supporting the plinth, and the other two holding their attributes. Kumara (left) is red and holds a rope noose and a three-feathered dart (bhindipala). Vishnu (mid-left) is green and holds a lotus and a white conch. Brahma (centre) is yellow and holds a rosary and sacred text. Indra (mid-right) is orange with a horizontal third-eye, and holds a jewel and a vajra. Rudra-Shiva (right) is bluish-white and makes the abhaya-mudra of dispelling fear and holds a damaru. Each of Guhyeshvari’s nine human and animal heads are adorned with a jewel-topped five-skull crown, and her youthful body is adorned with gold and bone ornaments, a tiger-skin loincloth, a long garland of freshly severed heads, a silk apron and a long scarf, and leggings embroidered with auspicious symbols. Her central blue-black face has a fierce expression, with bared teeth and three round transfixing eyes. To the right of this face are the heads of a two-eyed fierce red makara and a white horse, and to its left are the heads of a red garuda and a white elephant. Guhyeshvari’s second tier of heads consists of the central face of a squealing red boar, which is flanked to the right and left by the tawny heads of a tiger and a monkey. The goddess’s crowning face on the third tier is that of a white lion, with two piercing eyes and an upward-flowing mane. With her first pair of right and left hands Guhyeshvari holds a vajra-handled curved knife above a skull-cup in front of her heart. With her second pair she holds aloft a damaru and a triple-skull khatvanga. With her four other extended right hands she makes the boon-granting varada-mudra, and holds an iron hook, a jewel-topped golden club, and an iron sword. And with her four extended left hands she makes the abhaya-mudra of dispelling fear, and holds an iron hammer, a severed-head mace, and a trident. The oval of Guhyeshvari’s fiery aura and the triple-arch shape of her ornate halo are mirrored by the triple-curve of the torana above that enshrines that her divine form, its black interior adorned with stems bearing stylized flowers and leaves. Squatting in bow-and-arrow posture on lotuses on the lower left and right sides of Guhyeshvari are the white lion-headed guardian goddess Simhini (left), and the brown tiger-headed Vyaghrini (right), who both hold a curved-knife above a skull-cup, and a damaru and skull-topped khatvanga in their four hands. Below, in the lower left and right inner corners are the four-armed forms of white elephant-headed Ganapati, and his ‘youthful’ red half-brother Kumara. Ganapati holds a white radish or mueli and three sweets (laddu) in his two lower hands, and an iron hook and noose in his upper hands. While Kumara holds a golden vase and makes the abhaya-mudra of dispelling fear with his two lower hands, and holds a three-feathered dart (Skt. bhindipala) and a spear in his upper hands. 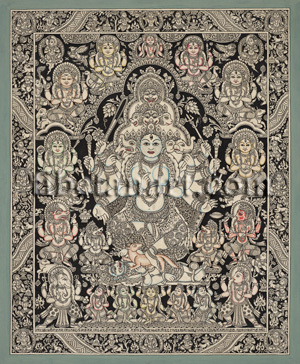 Circling above Ganapati and Kumara in a clockwise sequence are the "Eight Mother Goddesses" (Skt. Astamatrika) of the ancient Shakta Tantra tradition. These are the female counterparts of seven great Vedic gods, who along with Mahalakshmi embody the primordial energy or shakti of these Vedic deities. 1. Varahi from Varaha: 2. Vaishnavi from Vishnu: 3. Indrani from Indra: 4. Brahmani from Brahma: 5. Kaumari from Kumara: 6. Rudrani from Rudra-Shiva: 7. Mahalakshmi: 8. Chamunda from Yama. This is the clockwise order in which these eight Mother Goddesses appear in this composition. They all have three eyes and four hands, and with their first two hands make the bindu-kapala-mudra with their left thumbs and third-fingers touching above the skull-cups they each hold in their right hands. 1. Varahi (lower left) is red with the wrathful head of a boar. Her vehicle is a black buffalo and she holds a rope-noose and a fish in her two upper hands. 2. Vaishnavi is green, her vehicle is a garuda, and she holds a discus and club in her two upper hands. 3. Indrani is golden-yellow with a horizontal third eye: her vehicle is a white elephant and she holds a vajra and a parasol in her two upper hands. 4. Brahmani (top left) is yellow, her vehicle is a white goose, and her two upper hand attributes are a rosary and a sacred text. 5. Kaumari (top right) is red, her vehicle is a peacock, and she holds a triple-feathered dart and a spear in her two upper hands. 6. Rudrani or Maheshvari is white, her vehicle is a white bull, and she holds a damaru and trident in her two upper hands. 7. Mahalakshmi is golden-yellow and her vehicle is a white lion. She holds a golden mirror and a lotus in her two upper hands. 8. Chamundra (lower right) is blood-red and fierce, with an emaciated body: her vehicle is a male corpse, and she holds a damaru and a skull-topped club in her two upper hands. In the upper left and right corners are two squatting cloud-borne gods in circular auras holding the stems of two lotuses. Adjacent to them are a flying kinnara and a garuda, and below each of these gods are two devas holding a fly-whisk (left), and a mirror and lotus (right). The tantric motifs that appear in the main composition include: hanging brocade valances at the top, funeral pyres, yantras, jewels, fruit and grain offerings, and auspicious symbols. The narrow outer border of this composition depicts the "Eight Great Charnel Grounds" of ancient India, with one of the "Eight Dikpalas" (Skt. asta-dikpala), or "Lords of the Eight Quarters" of the universe appearing in aura-roundels at the centre of each cemetery. Traditionally these eight charnel grounds form the outer ‘protection-wheel’ of many Buddhist yidam and protector-deity mandalas, where they are separated by eight great rivers. These rivers are represented here by alternating bands of wave-shaped curves with lotus-petal shapes on their banks. The symbolism of these eight great charnel grounds is highly esoteric, with each figure, creature or attribute relating to the ‘inner-yoga’ practices of the subtle or vajra-body’s psychic ‘channels, winds and drops’. Apart from the figures of one of the Eight Dikpalas, each charnel ground contains a specific mahasiddha, a ‘field or realm’ protector, along with a specific kind of tree, stupa, mountain, fire, cloud, lake, and naga-serpent. Vultures, crows, owls, jackals, wolves, dogs, tigers and snakes roam within these cemeteries devouring corpses, whilst yogins and yoginis, human and divine ‘knowledge holders’ practice amidst yakshas, spirits, zombies, hungry ghosts, ogres, cannibals, headless spirits, ethereal beings, and stone lingams. 1. In the East (top) is the “Most Gruesome” charnel-ground: presided over by the yellow sky-god Indra with his horizontal third-eye, who holds a vajra and bell in his right and left hands. 2. In the South (right) is the “Frightful with Skeletons” charnel ground: presided over by blue-black Yama, the ‘Lord of the Dead’, who holds a sword and a rope noose in his right and left hands. 3. In the West (bottom) is the “Blazing Garland” charnel ground: presided over by the white water-god Varuna, who makes the abhaya-mudra and holds a naga-serpent with his two hands. 4. In the North (left) is the “Dense Jungle” charnel ground: presided over by the yellow wealth god Kubera, who holds a citron fruit and a mongoose in his right and left hands. 5. In the Northeast (upper left corner) is the “Wild Cries of Laughter” charnel ground: presided over by three-eyed white Isana (Shiva), who makes the abhaya-mudra and holds a trident. 6. In the Southeast (upper right corner) is the “Auspicious Grove” charnel ground: presided over by the red fire-god Agni, who holds a three-feathered dart (bhindipala) and a wooden stick in his two hands. 7. In the Southwest (lower right corner) is the “Terrible Darkness” charnel ground: presided over by blue Nairriti, the ‘Lord of the Rakshasa Demons’ who holds a sword and a shield. 8. In the Northwest (lower left corner) is the “Cries of Killi-Killi” charnel ground: presided over by the blue wind-god Vayu, who holds a billowing flag with his right hand.